So, you’ve been taking advantage of this mobile communication tactic for quite some time, and you’re ready to kick it up a notch. Don’t worry, we have just the solution. 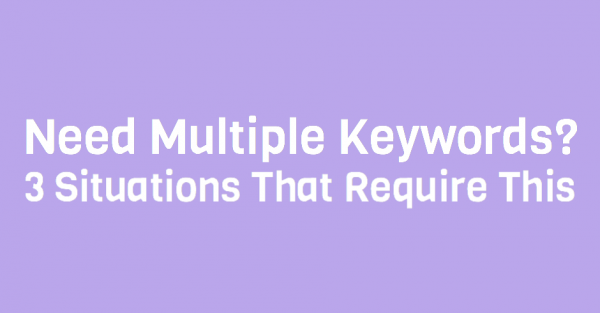 Try segmenting your list a bit by reserving multiple keywords. Here’s a few situations where this advice applies. You own one store with multiple locations. Keep the SMS marketing opt in process as simple as possible. You don’t want your customers to get confused, and show up at one store for another store’s promo. For example, let’s say you own two clothing stores, both within one hour of each other. Store A wants to do a BOGO promo, while store B wants to run a 20% off sale. By reserving one keyword for each location, you can easily separate these marketing campaigns. Your customer base is extremely diverse. So maybe you only own one location, but you serve a variety of diverse customers. Let’s say you own a fitness studio. On Monday, Wednesday, and Friday evenings, you hold a prenatal yoga class. Then, on Tuesday and Thursday mornings, you hold a group lifting class for serious fitness competitors. Now naturally, these two clients won’t be interested in the same message. Reserve two separate keywords for a qualified and tailored SMS experience. You want to deliver several different types of campaigns. Some subscribers might be interested in general announcements or exclusive information, while others only want high value mobile coupon codes. With that said, you want to cater to the changing needs of your customers. Separate out different campaign types by keywords. For example, if your customers are only interested in information, have them text INFO to the designated shortcode. If exclusive promo codes peak their interest, create a separate keyword for these campaigns. Partner up with top SMS marketing provider, Slicktext.com. Want to learn more? Give us a call at 1.800.688.6290. Ready to get started? Hop over to the pricing page and sign up for a free plan. We love educating our customers about the benefits of SMS marketing. Take time to comb through our handy learning tools, you won’t regret it.